The Model 1151 is NOVA’s flagship, military-grade color inkjet printer. Selected by Boeing for deployment aboard the P-8I Multi Mission Aircraft, the 1151 meets MIL-STD-461 (EMI/EMC), MIL-STD-704 (transients), MILSTD-810 (shock, transportation, bench handling, vibration, crash acceleration, explosive atmosphere, sand and dust, temperature, altitude and humidity). The 1151 uses the same Hewlett Packard 6230 print engine as Model 1101, NOVA’s RCOTS sibling model. However, the 1151 is more robust, contains expanded features, and conforms to military grade specifications. From a performance perspective, Model 1151 is rated at 18 pagesperminuted in black mode, and up to 10 pages-per-minute in color mode; draft printing increases speed but reduces print quality. Standard HP ink cartridges are used. Power consumption is approximately 24W while printing and a mere ~1W in standby mode. When the internal heater option is installed, power consumption is 172W in sustained print mode and 127W in standby mode. The heater option allows the printer to operate down to -40°C. Standard I/O interfaces include USB 2.0 and Ethernet (10/100 Base-T). The USB port is pinned out to Amphenol’s popular “USBFTV” FIELD circular connector. The Ethernet port is pinned out to Amphenol’s “RJFTV” FIELD circular connector. Custom data connectors and power cords of can be configured. A “Short” model is also available which reduces depth from roughly 24” to 17”. 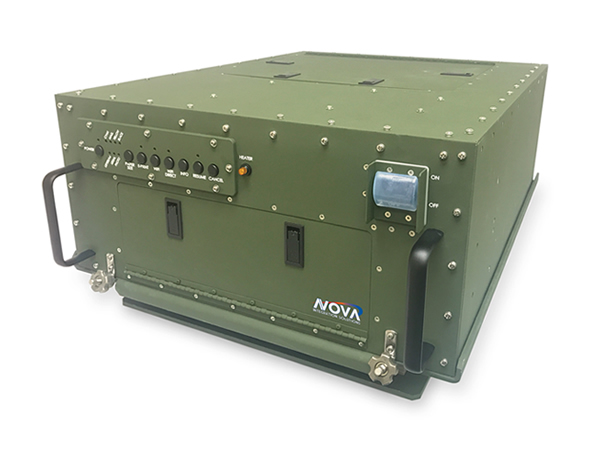 Contact Nova Integration Solutions for more information.